Everybody's favorite yellow, bendy-tailed buddy loves to learn, learn, learn! 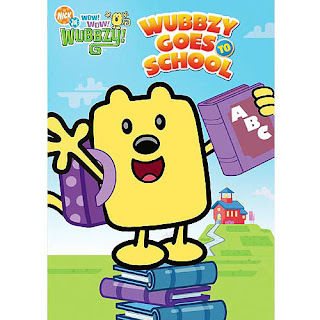 Watch as Wubbzy faces his fear of going to school, Widget trains to be a ballerina and everybody tries to learn tricks from Moo Moo, The Magician. Join the fun, as Wubbzy and his friends meet new kids and discover new experiences, with plenty of singing and dancing along the way. My kids come to a pause and their attention is completely had as soon as they hear the Wow! Wow! Wubbzy! Theme Song! There's something about this adorable little yellow guy and his friends that just captivates them! They eagerly took their places in front of the television and watched gleefully as Wubbzy faced his fears of attending school, and had some fun with his friends. The theme was fitting in our home, as B just started school this year, and is currently facing down some of his own fears ;). School can be a big adjustment for little one's and this great DVD is a wonderful "icebreaker"......and just pure fun! Wait there's more! There's a CD-ROM capability which includes fun Coloring & Activity Sheets for the kiddo's. My kid's loved coloring while watching the movie the second time around ( it's been replayed a few times over the past week in our house...a definite fave)! For back to school fun with Wow! Wow! Wubbzy! Find Wubbzy Goes to School at a retailer near you!